So different from it's former life as a flower. you are the Queen of Macro. Brrr... Those flowers look *cold*. I'm sad to see the flowers gone. Love the mood you captured--somber yet the the background dreams of spring. That makes me want to curl up with a mug of warm tea! How pretty. Perfect for the season. I like the soft texture and muted tones. These really make me feel the end of fall and the coming of winter. Great shot! 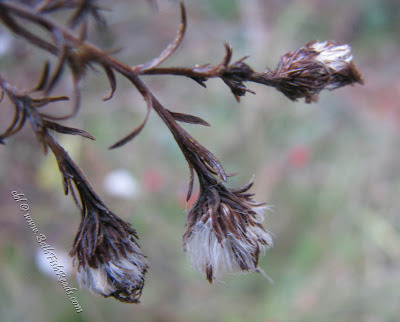 November Gardens … are not cheery, bright or happy. Great focus! Love the depth of field. That's kind of peaceful - plants fading to sleep for the winter.